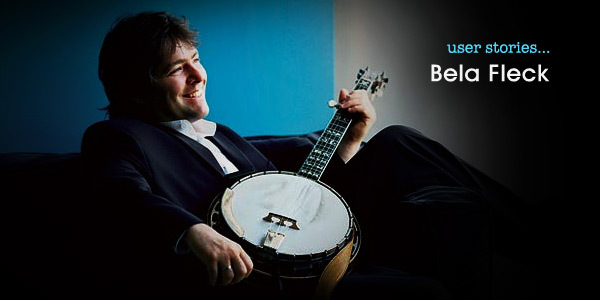 Bela Fleck is often considered the premier banjo player in the world. A New York City native, he picked up the banjo at age 15 after being awed by the bluegrass music of Flatt & Scruggs. While still in high school he began experimenting with playing bebop jazz on his banjo, mentored by fellow banjo renegade Tony Trischka. In 1989 he formed the genre-busting Flecktones, with members equally talented and adventurous as himself. As fans ourselves, we were thrilled to learn that he’s added a new dimension to his unique approach to music with Omnisphere. The Flecktones are purveyors of all things technological, Futureman has also extensively used Spectrasonics sound libraries over the years and often creatively utilizes sounds from Heart of Africa in his live solos using his customized “SynthAxe” and Zendrum controllers. The Flecktones are: Victor Wooten- Bass Guitar, Jeff Coffin - Sax/Flute, Futureman -SynthAxe & Drumitar and Bela Fleck - Banjo.